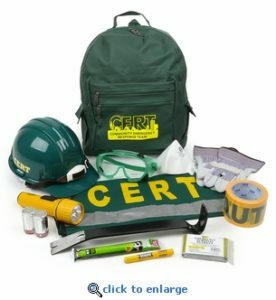 Thanks to Matt Oltramari and Kaila Williams of Fort Bend County, Meadows Place has been offered the opportunity to create its very own Citizens Emergency Response Team – aka CERT. 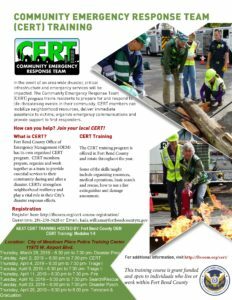 The CERT program educates citizen volunteers about disaster preparedness for the hazards that may impact their area and trains them in basic disaster response skills, such as fire safety, light search and rescue, team organization, and disaster medical operations. 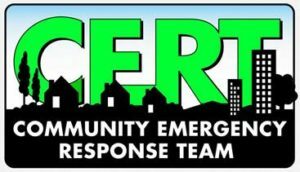 CERT members are also asked to assist local Police and Fire departments in crowd control and light traffic control during parades and events. It is completely voluntary and it is free. For more information email Meadows Place own Matt Oltramari at moltremari5@gmail.com or Kaila.Williams@fortbendcountytx.gov . This is a great opportunity. Hope you will join us.